Progressive Democrats of America supports progressive candidates from Bernie Sanders for president to strong contenders for the U.S. Senate and House. We confront failed neoliberal and neoconservative policies with campaigns like Healthcare Not Warfare and Windmills Not Weapons. We organized with our allies at the People's Summit in Chicago in June, and hosted Progressive Central in Philadelphia in July. We've helped focus national efforts to pass ColoardoCare in that state. All that is important, but PDA is only as strong as our individual activists and local chapters. We need you to get involved with your local and state chapters, or help launch new chapters in your area. You can accomplish important Things as well. Please contact contact PDA Field Coordinator Judy Hess to get empowered! She and Dan O'Neal will help you start or expand your local and state PDA chapter. Please support our latest efforts. Please donate whatever you can here to support Medea Benjamin's book tour. And/or contribute generously to support PDA's efforts on behalf of ColoradoCare, the historic legislation to guarantee healthcare to all Coloradans. Earlier this week on Labor Day, we discussed our thanks to organized labor and expressed our thanks for all National Nurses United (NNU) does to support progress. Last month, we reported on the work busy Illinois progressives were doing. They haven't let up at all, not even on holidays. 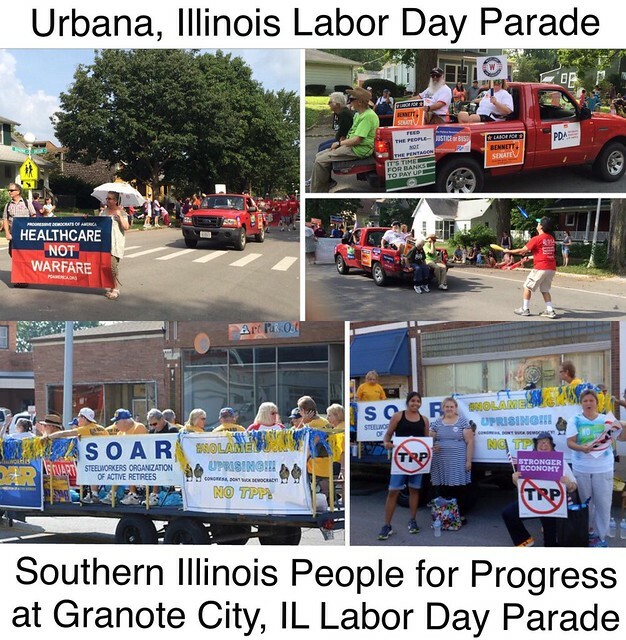 PDA Central Illinois and Southern Illinois People for Progress showed their support for labor, and that includes their opposition to the Trans-Pacific Partnership (TPP) in Labor Day Parades. Several other PDA chapters also participated in parades. Later this month, PDA activists will hand-deliver Educate Congress letters to congressional offices to oppose the TPP and advocate for good legislation. Please contact contact Judy Hess to get involved with these "letter drops." In thanks and recognition, we're highlighting local and state PDA success stories. Most recently, we showcased the chapter meeting and discussion of "Our Revolution" in Central Valley/Sierra, CA. Help us share the news about your own efforts! Please send the who, what, where, why, when, and how information to me, Mike@PDAmerica.org and your chapter may be featured next! Money tight? Then please contact Donna Smith if you can join PDA in Colorado working for ColoradoCare. We can help find you housing, and get you knocking on doors to help us win this critically important effort! Can't make it to Colorado? Then sign up to volunteer with Mike "Phone Guy" Fox to make easy but important calls from your own home. We need you to pitch in to win! "PDA and Donna Smith, both nationally and at the state level, have been strong supporters of Colorado's efforts to pass Amendment 69 and secure universal health care. PDA walks the progressive walk and we've watched them skillfully, tenaciously, and powerfully fight against the multi-national corporate profiteers and advocate for the people and for the basic human right to have health care. Colorado is grateful for PDA." Medicare for All will help save lives (and money), and we expect that when Colorado passes Amendment 69 in November, other states will follow soon after. Please say we can count on you to help our Autumn 2016 Healthcare Not Warfare efforts! For peace: Please donate whatever you can here to support Medea Benjamin's book tour. For Healthcare: Please contribute generously to support PDA's efforts on behalf of ColoradoCare.